Thursday March 10th 1881 I was sick all the forenoon but sat up and worked in the afternoon. Went to bed early. I got three of my Petersons this morning. 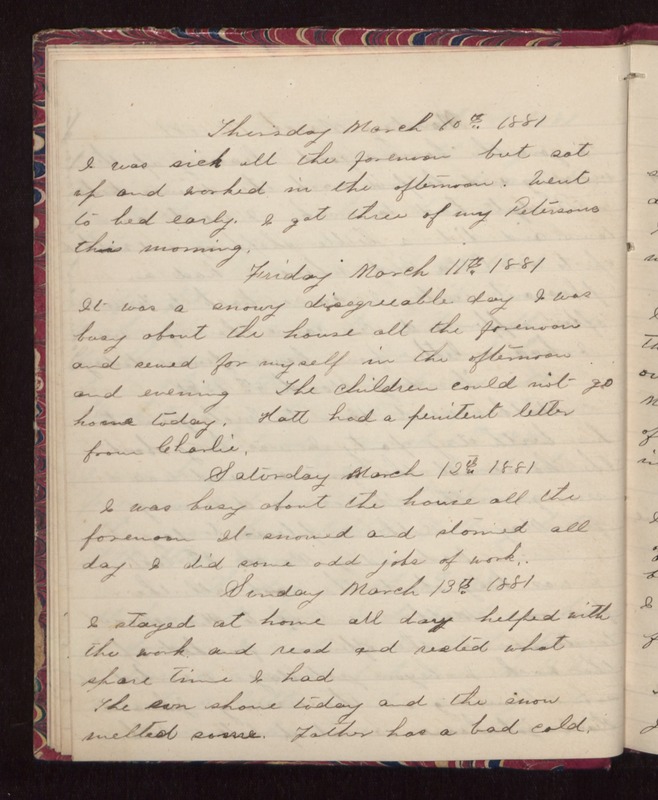 Friday March 11th 1881 It was a snowy disagreeable day I was busy about the house all the forenoon and sewed for myself in the afternoon and evening The children could not go home today. Hatt had a penitent letter from Charlie. Saturday March 12th 1881 I was busy about the house all the forenoon It snowed and stormed all day. I did some odd jobs of work. Sunday March 13th 1881 I stayed at home all day helped with the work, and read and rested what spare time I had. The sun shone today and the snow melted some. Father has a bad cold.